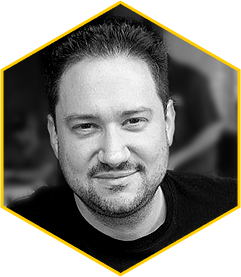 Paul Hirsch is co-founder of Studio1337. He spent most of his life in Cleveland, Akron and Canton, Ohio, and currently calls Pflugerville, Texas home, which comes with all of the perks of living near Austin, without the crazy traffic. Paul’s career in media began with his academic background, consisting of public relations, advertising and news journalism, and minors in computer information systems and sociology. He transitioned to Internet development during his post-graduate studies in media management, and he has been developing Websites for clients since 2001. Today, he specializes in traditional design and development with an emphasis on efficiency, usability and accessibility. He is proficient with PHP, various scripting languages, and he is an experienced copywriter and editor, bringing his writing and public relations background into every project Studio1337 undertakes. When he’s not working, Paul enjoys playing pool (he was nationally ranked in college), playing the piano, bowling, watching movies, reading, good food and wine and traveling to new and interesting places. He is married to Amy, the most wonderful woman in the whole world (naturally he’s a bit biased), and they share their lives with two puppies, Sophie and Max.